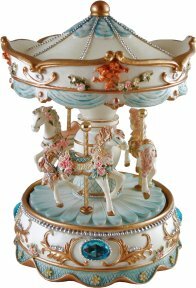 Musical Carousels of Distinction "Sapphire" A small, elegant musical carousel from the Distinction Series. This superior collection of musical carousels are individually cast with the finest of detailing and meticulously painted by hand. Enjoy discovering the subtle differences as the carousel turns to reveal the horses individual characteristics, each of which are set into place on a twisted brass rod. A collectible item for the carousel connoisseur. Tune : Edelweiss Approx Size : 15 x 11cm (6" x 4 1/4") Order Code : BBCAR067 Price : £39.00 *Please note this is an ornamental item that contains small removeable parts. *It is not a toy and not suitable for children to use unattended.